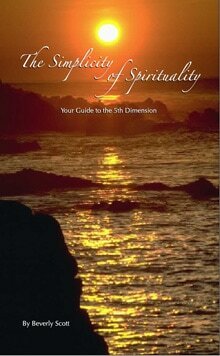 Excerpt from The Simplicity of Spirituality: Your Journey Into the 5th Dimension. "The 5th Dimension is not a physical destination, but a journey taking you deeper within yourself. The 5th Dimension is simply the ongoing of our journey back to God with the refinement of our own frequencies as we grow. We are in a time period now where our Planet Earth is moving into the 5th Dimension. Consequently her frequencies are changing, and the things of the 3rd dimension are dissipating. As a result, our world as we know it is changing, our financial institutions are upside down, and our governments are in turmoil. At the same time we human beings are being given challenges to deal with and to learn from or not, depending on whether or not we have chosen to make the journey with our Planet Earth into the 5th Dimension. What we consider to be a recession, a depression or even the end of the world is actually the clearing out, the dissipation of, the cleaning up of the other side of the coin: one side of the coin being love, the other side, fear. We are all in this process together, moving out of fear, and we all have fear of one kind or another, and moving into love, realizing the love that we are and the love we want to give and to receive from the world. Things that work for us here in the 3rd Dimension will not work for us in the 5th. Anger, fear, greed, dishonesty, our need to control, war, hatred, envy, coveting material things, these are all things of the 3rd Dimension existing at very slow and heavy vibrational frequency. Consequently if we want to move along on our path into the 5th Dimension it is necessary that we release these lower frequencies from our existence, and that is what all the upheaval going on in our lives and on our Planet Earth is about right now. We are being given circumstances in our lives to look at and to study, opportunities to learn what is really important in our lives, and in that process to finally realize that the only security that exists is love for, and trust in, God. God is the constant, the only real thing we have going for us, the only thing we can depend on, the only thing that will never fail us. The God that I am talking about here is, as stated in the Bible in the book of 1st John 1:5 God is light, 4:8 God is love; and again 4:16 God is love. If you prefer, you can call it a higher power, that which holds everything together, truth, Oneness, it doesn’t matter what you call it, it’s all the same thing. As we work our way into the 5th dimension we grow closer to the God that we are, as we choose to change our minds, as we choose to step out of the negative band of fear, and onto the path of more love. Even now you may be experiencing the 5th dimension at times. There are so many dimensions, and we move from one to another all the time. We’re not aware of it, but we do. For instance, when you are sitting in front of your computer, not doing anything in particular, just staring into space with nothing really going on, you are in the 1st, maybe the 2nd dimension, a place of birth where the potential of more exists. So you sit there just mulling things over, and suddenly something pops into your mind, you have birthed an idea, and there you are bringing your idea to fruition in the 3rd dimension."